I had never heard of Karakuri Odette, not one bit. In a lot of ways, this is what I want from the Manga Movable Feast; I like being introduced to a series, but I get recommendations all the time as I’m sure many others do, so having the push to pick it up is helpful. Karakuri Odette also provides a story that has underlying themes to mull over so it fulfills another point when I think about what I want from the MMF. The series is rather subdued but combines coming of age moments with the moral ambiguity of what exactly robots are for. The storytelling somewhat reminded me of (wonderful) Nari Kasukawa in the quiet approach to humor and relationships but Julietta Suzuki folds in a darker look at morality with it. As we stated in our Mushishi article for the MMF a compelling method of examining humanity is looking at people through an inhuman lens. Androids fill this niche extremely well because while they look exactly like a human they are still removed from humanity by virtue of their creation. Androids can commingle with humans without creating a fuss but still allow an outsiders perspective of what makes a human a human. Androids are also useful metaphors for those who are alienated or on the fringe due to their nature. They are at first glance part of the group but they are also fundamental removed. Karakuri Odette can be seen as a romantic comedy that uses robotics to examine more than just the concept of can a human love a robot and be loved back. Karakuri Odette takes the older concepts often used in classic science fiction to explore the heart of humanity. At the same time it is a sweet story with tales of friendship and romance mixed with dash of humor. It hearkens back to the day when shojo used science fiction to tell stories while having a more modern sense of whimsy. Karakuri Odette is a piece that helps diversify the shojo manga available in English. Odette, a robot, finds herself desiring to explore and experience the world so she asks for that chance from her creator. The Professor agrees to let her attend high school. 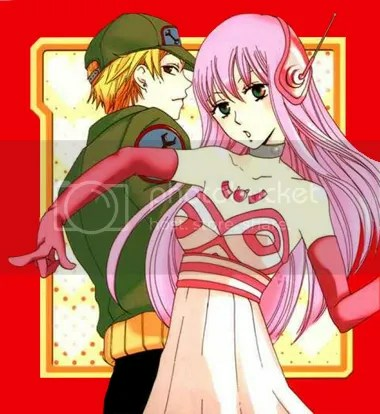 This story fits in with its peers but also begins to explore further themes than wackiness ensues as robot girl enters high school or robot girl falls in love with human boy. Though certainly those things occur or, in the case of the later, look to be on the horizon (or maybe that is wishful thinking). Each story is a chance for Odette to learn a little more about humanity. Whether it’s new friends at school, a fellow robot, or a lost child Odette’s ferocity to be more human, perhaps even a better human, is felt. The comes a time in every sentient android’s life where she discovers previously unknown processes running through her CPU that she has never had before. In Odette’s case she wonders what separates an artificial girl like her from normal human girls. So she convinces the scientist who made her, Professor Yoshizawa, to let her enroll in high school in order to discover what separates man from machine. 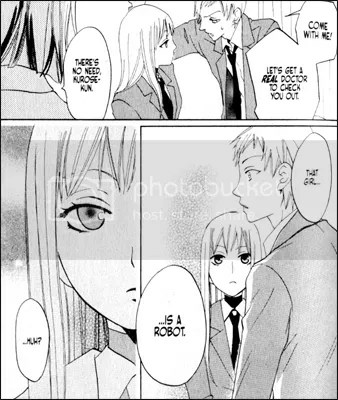 At school she learns what it is to be human and what it means to be an android from people like her sickly friend Yoko Morino and the handsome rebel Asao Kurose. Odette is a character with which an immediate connection occurs, her straight-faced reactions combined with her honest curiosity about the world strike an odd balance throughout the story. This allows her to be unintentionally humorous at times and profound at others. Odette feels like a robot to the audience, you don’t forget what she is even as her understanding broadens, but because she is mechanical she can put so much effort into learning what it is to be a human. She strives for the good characteristics of humans by helping others and pursuing friends (even when resisted). Currently Odette is free of more negative traits, though she shows the feeling of loneliness, she isn’t hurt by anger or rejection as yet. However, as we see other robots it is clear that Odette indeed has a personality and is therefore already different. How she affects those she encounters, be they human or otherwise, is where a lot of the magic in the series occurs. I am very curious to see who Odette will be at the end of this story. There is a very simple stock character who is the inhuman that wishes to be human. They usually always a rather strange individual but are often much more human than they realize. But being a stock archetype does not mean you cannot be a great character. The puppet that wishes to be human usually shines through its inhuman quirks. Odette has a delightful deadpan that is sharp enough to mark her as weird but still warm enough that you can connect with her. The other thing that makes a this type of character shine is in what ways they are human despite their being an artificial life form. Odette always has a strong feeling of loneliness that makes her sympathetic. But at the same time you always feel she is slowly reaching out to her human acquaintances which gives her a feeling of growth that is vital. Then again I might also just have an inherent prejudice to think better of all pink–haired girls. I don’t really have much to say about Asao Kurose because he is a blond delinquent who is secretly very caring and the main romantic interest. Anything I will say about him will be rendered utterly redundant by the mere fact that he is so clearly “a Narutaki character” and therefore she can talk about him for pages. I will say that he makes a good foil for Odette as someone how knows that she is a robot at school and as a romantic interest. There are many prominent people who fit into Odette’s ever-expanding world; Asao just happens to be the best one. 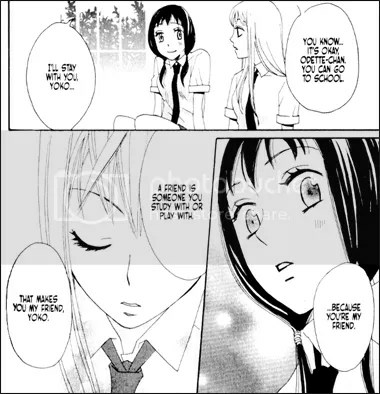 Asao was an unexpected, but not unwelcome, recurring character in the cast as Odette pursued friendships with her classmates. His reputation as a delinquent actually brings a challenge to Odette because she sees him as good while everyone else believes him to be bad and warns her against him. This forces her to start navigating social waters and learning about judgment. While I think it is still up in the air with only one volume read, there are roads leading to Asao possibly developing feelings for Odette. But because I can’t truly say what Odette’s growth will be, it is all speculation, though I do feel the writing is on the wall. And so if Odette learns to love through a snarky, blond delinquent . . . well you won’t hear me complaining! Rounding out the cast of the first book is the Professor, Yoko, and Miwako. The professor is an eccentric genius in that kindly mad scientist tradition. He views Odette both as an important experiment and as a daughter. And like any parent he finds himself driven up the wall by Odette to great comedic effect. On the school front Yoko is both Odette’s first friend and inadvertent member of a love triangle between her, Odette, and Asao. While Asao has a crush on Yoko she always has her eyes on the mostly unseen boy named Okada. Yoko has an unnamed chronic illness which leaves result in her sometimes have attacks and has as an overall weakened constitution. While she is very supportive of Odette is generally unaware of her place in the love triangle. 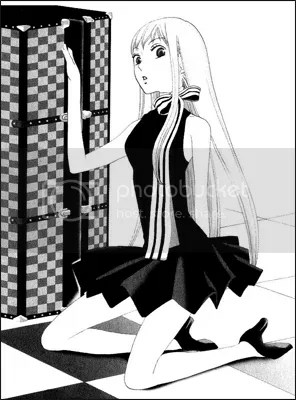 Miwako is the mutual friend of Odette and Yoko and fills the role of side character friend. I mostly only mention her because the buns on her head make her look like Mickey Mouse. The approach in Karakuri Odette is a good mix of light and dark where neither overtakes the other for too long a period of time. There is a bit to be learned by the reader while following Odette as she in turns grows and learns as well. The journey so far has been gratifying and serves to remind you of your humanity. I look forward very much to finishing this series. I would really like to go back and write another article about this series when all the books are out. Although we both only read the first book for this post I did go to the library and stumbled on the 4th book. Odette has clearly made progress as a character which is always nice to see. I am curious how far they go with her when they complete the series. I would be curious to compare and contrast how this series deal with the concept of artificial humans and their relationship to humanity as compared to other manga like Chobits and Astroboy as well as other types of fiction like Star Trek: The Next Generation and Asimov. Anyone else who has read all the books can feel free to run with this idea as I would really like to see this manga compared to a wide variety material. The character of Odette is also somewhat similar to another android girl named Aigis from the video game, Persona 3. I don’t know how familiar you are with the game, but Aigis is a character who also goes to high school (albeit for different reasons) and is attracted to the main character of the game. She was also trying to understand what it means to be human and trying to comprehend “feelings”. I think Japan has wondered about androids and their their relationships with humans in manga since at least Astro Boy (if not earlier). Manga loves to use the android as a tool of exploring humanity. That said I do wonder what you think of the growth of Odette vs. Aigis after you have read all of Karakuri Odette and finished Persona 3. While they are very different mediums I am curious who you think makes more of an impression. Good question. Aigis is supposed to be a battle android, so in some sense, she is more appealing in terms of looks. Her character is somewhat popular among Japanese pop culture fans who are familiar with the Persona series. Her obsession with the main character has been a topic for jokes.